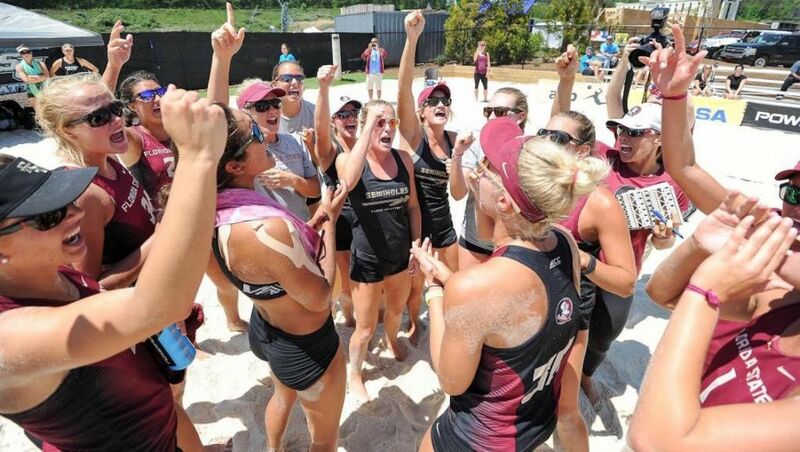 TALLAHASSEE, Fla. – The Florida State Beach Volleyball team earned a bid to play in the inaugural NCAA Beach Volleyball Championship. The Seminoles received word late Sunday night that they were one of eight schools selected to compete in the newest NCAA championship event, which will be held in Gulf Shores, Ala., May 6-8. Florida State will begin its quest for the inaugural national championship on Friday, May 6 as the No. 1 overall seed in the tournament. The Seminoles will open the championship against eighth-seeded Stetson (28-7) at 9:00 am CT. The Seminoles and Hatters have not faced each other in 2016. The other six teams included in the eight-team field are No. 2 Southern Cal, No. 3 Pepperdine, No. 4 UCLA, No. 5 Hawaii, No. 6 Arizona and No. 7 Georgia State. FSU finished the regular season 29-1 and ranked in the top three of the AVCA Beach Volleyball rankings all season long. The Seminoles captured the Coastal Collegiate Sports Association conference title in Emerson, Ga., two weeks ago outscoring the competition 21-2 over five matches. The Seminoles, who faced top competition all season long, went 16-1 against ranked foes as eight of those 16 victories came against schools ranked in the top 10. FSU also posted an impressive 25-1 record away from home in 2016 including a 19-1 mark on neutral sand. FSU has faced four of the seven schools selected to compete in Gulf Shores this weekend going 5-1 against those teams. The three schools the Seminoles have not faced this year are Stetson, Pepperdine and Arizona. The Seminoles are quite familiar with the beach at Gulf Shores having played in all four AVCA National Championship events from 2012 to 2015. Florida State, along with Pepperdine, were the only two schools to play for the national championship in each of those four seasons. The Garnet & Gold finished as the national runner-up in 2014, while recording back-to-back top three finishes in 2012 and 2013. The 2016 NCAA Beach Volleyball Championship will feature a double elimination, bracket play tournament with the two remaining schools playing a winner-take-all match on Sunday at 2:00 p.m. The NCAA also announced that Turner networks will televise all three days of the championship, with truTV providing live coverage on Friday, May 6, and Saturday, May 7, from 3-6 p.m. ET and the championship round airing on TBS on Sunday, May 8. Live streaming coverage of every court in each match of the tournament will be available on NCAA.com. In addition, the full television broadcast will be available on Turner’s TV Everywhere platforms including the Watch TBS and Watch truTV apps. Stay tuned to Seminoles.com throughout the week for more information on the NCAA Beach Volleyball Championship. As always, fans can also follow the Noles on Twitter (FSU_BeachVB) and on Instagram (FSUBeachVolleyball) for continued updates on team.